The artificial grass practice mats were open for play this past week. This turf surface, manufactured and installed by TurfHound Tee Surfaces, is the premier artificial turf product in the industry and is widely used in local area Club’s and throughout the country. Golfers have been impressed with the visual quality of the product, but more importantly, with the feel of the club striking the surface. It provides a consistent area for our golfers to practice their swing and warm up before going out to the golf course. There are two distinct turf areas within the 28 teeing stations. The shorter turf area is designed to resemble our tee boxes and fairways while the longer turf area is designed to resemble our rough height of cut. The shorter area has a rubber slot to be able to place our plastic tees in at any height. Please feel free to use any club to hit from either area. For the remainder of the month, the new mats will be used so that the “real” turf grass in front of the tee can be adequately fertilized and allowed to recover prior to the cooler weather in the winter months and slower growth. It is our anticipation to rotate between the grass and artificial turf surfaces as needed with the main objective to have a turf area that is representative of the playing experience out on the golf course. Weather will be a large determining factor as to the quality and condition of the grass; however, your practicing methods will have the greatest impact. Please do not scatter your divots within the practice area but rather concentrate your shots to a confined area. This will greatly aide in turf recovery. Over the past month, the Copperleaf Maintenance Department has been tirelessly working to remove buried rocks and other debris from beneath the turf surface on our tees and now fairways. 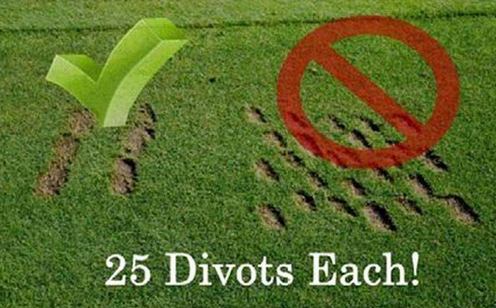 There have always been several problematic areas throughout the course where the turf grass simply does not perform as well as the grass surrounding it. 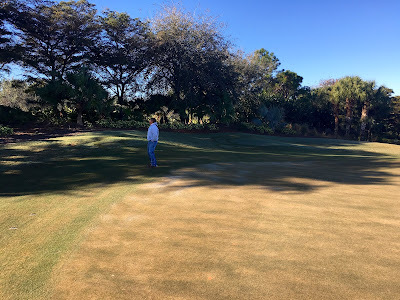 These areas are maintained the same way with regard to irrigation, fertilization and mowing, however, they show signs of stress and discoloration throughout the year. Several years ago, a machine was contracted in an attempt to relieve the compaction in these areas to allow for increased water and fertilizer penetration and improve oxygen exchange in an attempt to provide a consistent and healthy playing surface. Unfortunately this machine discovered areas of buried rocks that would need to be physically removed to improve the area. The task of identifying and removing the rocks has been on the "to do list" for many years but due to the demand of completing other projects such as building rock walls as well as landscaping and irrigation projects, this task has always been postponed. The rocks have always been under the surface since the course was built back in 1999/2000. Please remember that the construction work performed last year consisted of a "no till" grassing process where the new grass was installed into the existing fairway contours and teeing grounds. There were modifications made to the greens complexes only. A rock the size of a softball or even a basketball is not felt by the heavy equipment used to move the soil, however, it is noticed by our smaller specialty equipment used to improve soil conditions. Several rocks have been quite large and have simply been buried by 3 inches of soil making them impossible to see from above. Although this is a tedious, time consuming, labor intensive process the effort will be well worth it. It should be no secret that buried rocks in the soil where you are trying to grow manicured turf makes it very challenging to provide the a quality playing surface. Providing a consistent growing media for our turf grass roots to grow in will allow for a high quality and uniform playing surface for our members and guests to enjoy. Compaction will be reduced, water infiltration will increase and turf health will improve. When we begin the aerification process later in the year, the removal of these rocks will reduce the damage to our expensive machines and help to make the process more efficient. Looking at our tee surfaces today, you can clearly see the improvement to the turf quality making the project worthwhile. I appreciate your patience during this process and please know that this will take several months and possibly into next summer to complete. I can't thank our staff members enough for been persistent during this hard work and repairing the damage to the turf areas where the rocks have been removed to a high standard. They call Florida the Sunshine State. After the month of January; I would like to know who "they" are. Out of the 31 days in the month, there were 24 days that were cloudy and overcast and over 12 inches of rain fell on the golf course. Not what I would call "sunshine". Shade has been an issue on two of our greens on Holes 7 and 10. The Palm trees on Hole 7 to the left of the green as well as the Shady Lady trees behind the green of Hole 10 have recently been pruned to allow more sunlight and to help increase soil temperature. Not only does the lack of sunlight cause a problem but the shade also decreases the temperature of the soil. Our warm season grass needs both direct sunlight and soil temperatures above 65 degrees to actively grow. With the sun so low in the sky this time of year, the effective sunlight is diminished due to the low angle in the horizon. This creates greater problems from surrounding trees and buildings as they cast a larger shadow across the turf. The cool weather experienced during the month, including a mild frost, has had an impact on the color of the turf grass as well. The warm season Bermuda grass that is used throughout the golf course turns to a straw color during the cooler weather as it struggles with dormancy. This, coupled with excess traffic that compacts the soil makes it difficult to grow green, healthy turf. As the warmer weather returns and cultural practices resume, the turf grass will return to its natural vibrant green color. Your golf maintenance team is doing everything it can to provide quality playing conditions for all golfers. With your help, and hopefully some sunny weather from Mother Nature, the golf course will remain healthy and enjoyable for the remainder of the golfing season.